FOR IMMEDIATE RELEASE – How often do you prefer to replace your hot water tank? Every 3-5 years? 5-10 years? Never again? Your traditional electric/boiler/gas hot water tank needs to be replaced every 5-10 years. 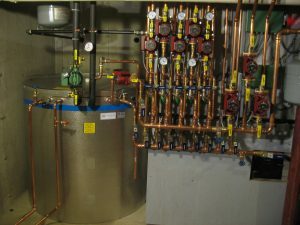 However, non-pressure tanks for solar thermal hot water systems have a life expectancy of 40+ years. Here’s the catch: even though the solar tanks last a lifetime, most solar thermal hot water companies only offer a 5 -7 year warranty. SunMaxx Solar’s new tank warranty strategy is pretty genius, and the best in the industry by a long shot. The company has developed an option to double your solar non-pressure tank’s warranty, extending it for up to 20 years. First, there is the standard 10 year warranty. You can now purchase a 5 year extension for $500 (15 year total), or pay $700 to double the standard warranty to 20 years. Another plus? SunMaxx Solar manufactures the tanks from scratch right here in the USA. There are a variety of sizes from 120 gallons – 5,000 gallons. The tanks can be used for heating your domestic hot water, space heating, pool/spa heating, radiant floor heating, or all the above! SunMaxx Solar is an industry leader in the manufacture and distribution of turnkey solar thermal solutions for domestic hot water and space heating systems. For more information, please visit us online at www.sunmaxxsolar.com. You can also contact a solar thermal specialist at 1.877.786.6299.